The Coldstream Guards are in the front line at Boiry St Martin when a German artillery shell lands in the trenches killing Lieutenant Horatio Spencer Walpole at age 36. His brother the heir presumptive to the Baronies of Walpole was killed in September 1915. All the Camels of 208th Squadron are burned at La Gorgue aerodrome to avoid capture by the advancing enemy when they are caught in a fog bank before the area is evacuated. Second Lieutenant Joseph Henry Collin (King’s Own Lancaster Regiment) is killed one day short of this 25th birthday. At Givenchy, France, after offering a gallant resistance against heavy odds in the Keep held by his platoon, Second Lieutenant Collin, with only five of his men remaining, slowly withdraws, contesting every inch of ground. Single-handed, he then attacks a machine-gun and after firing his revolver into the enemy, he seizes a Mills grenade and throws it into the hostile gun team, putting the gun out of action, killing four of the team and wounding two others. He then takes a Lewis gun and engages a second hostile machine-gun, keeping the enemy at bay until he is mortally wounded. Lieutenant Collin will be awarded a posthumous Victoria Cross for his actions on this day. At Givenchy, France, Second Lieutenant John Schofield (Lancashire Fusiliers) leads a party of nine men against a strong-point and is attacked by about 100 of the enemy, but his skillful use of men and weapons results in the taking of 20 prisoners. Having made his party up to ten he then proceeds towards the front line, where he meets large numbers of the enemy, on whom his party opens fire. He climbs on the parapet under point-blank machine-gun fire and by his fearless demeanor forces the enemy to surrender. As a result 123 of them, including several officers, are captured. He himself is killed a few minutes later. For his actions he will be awarded a posthumous Victoria Cross. Major William Ellis MC (Royal Field Artillery) is killed in action at age 31. He is the son of Alderman John Ellis JP. Major James Wightman (East Surrey Regiment) dies of wounds received in action five days earlier. His brother was killed in action on that day serving in a different regiment. Captain E F S Mather (Manitoba Regiment) is killed in action at age 29. He passed the Cambridge Staff College course with honors. Captain Wilfred Roderick Powell (Dorset Regiment) is killed in action at the Battle of Berukin, twenty miles east of Jaffa. He is the son of the Reverend Morgan Powell Vicar of Aberaman. Captain Ralph Hopton Baskerville (Glamorgan Yeomanry attached Welsh Regiment) is killed in action at age 35. He is the Master of the East Sussex Foxhounds. Captain Percival Warburton Hawkes (Liverpool Regiment) is killed at age 34. He was a scout master. 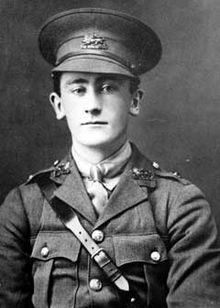 Captain Michael Meade MC (Liverpool Regiment) is killed at age 22. He is the son of the Right Honorable Joseph Meade. Captain George Beaumont MC (East Surrey Regiment) is killed in action at age 29. His brother was killed in April 1915. Lieutenant Ronald Grahame Henderson MC (Australian Infantry) is killed at age 25 at Gentelles while extricating his platoon from their billets, during an artillery bombardment. His brother was killed five days ago. Lieutenant Walter Haliburton Routledge Crick (Dorsetshire Regiment) is killed at age 21. He is the only son of the Reverend Walter Crick Vicar of Oving Deir. Lieutenant George Crompton Owen (South Lancashire Regiment) is killed in action at age 25. He is the son of Councellor C Crompton JP. Lieutenant Alex Clarkson MacLean (Royal Engineers) is killed in action at age 34. He is the son of General H J MacLean (Rifle Brigade) who lost his elder son five days earlier. Lieutenant Mark Christopher Ball (Royal Engineers) is killed at age 20. His brother was killed in July 1916. Lieutenant Noel Goodricke Addison MC (King Edward’s Horse) is killed in action at age 25. He had two brothers who have been previously killed in the Great War. Lieutenant Bernard Cecil Blake (Royal Field Artillery) is killed in action at age 35. His is the son of J W Blake JP. Second Lieutenant Alexander Campbell Connal (Royal Garrison Artillery) dies of wounds as a prisoner at age 19. His older brother was killed in October 1916. Second Lieutenant Robert Proelss Perry (Middlesex Regiment) killed in action at Neuville Vitasse at age 21. He was an Open Exhibitioner (Mathmatics) at Christ College, Cambridge. Second Lieutenant Richard Arnold Bothamley (West Kent Yeomanry attached Machine Gun Corps) is killed at age 26. His brother was killed in September 1916. Chaplain the Reverend John J McDonnell is killed at age 41. Sergeant Hubert Sydney Turtill (Royal Engineers) is killed at age 38. He played one test for the All Blacks Rugby Club versus Australian. His son will be killed in November 1941 serving in North Africa. Corporal Albert Sidney Rasmus (Middlesex Regiment) is killed at age 27 at Ploegstreert. His brother was killed in October 1916. Lance Corporal Sidney James Pratt (Norfolk Regiment) is killed at age 25. His brother died of diphtheria in November 1915 at home at age 16. Lance Corporal Duncan McLennan (Royal Scots) is killed in action at age 21. His brother died of wounds in October 1917. Lance Corporal John A Johnson (King Edward’s Horse) is killed. His brother was killed in July 1916. Able Seaman Edward John Price (Anson Battalion Royal Naval Division) is killed at age 22. His brother was killed in May 1917. Private Arthur Waller MM (Alberta Regiment) is killed in action at age 22. He dies eight days short of the one-year anniversary of the death in action of his brother. Private Ronald Victor Ralli Robertson (Royal Army Medical Corps) is killed at age 30. He is the son of the late John Robertson DD the former Vicar of Bradford and the Honorable Canon of Ripon. Driver Edward Hadaway (Army Service Corps) is killed in action at age 30. His brother died of wounds in January 1917. Private Harold Cain (Liverpool Regiment) is killed at age 33. He is the son of Alderman Benjamin Cain JP and his brother was killed in May 1915. Private George Henry Godfrey (East Surrey Regiment) is killed at age 31. His brother was killed in October 1916. Private Frank Hodge (Lancaster Regiment) is killed at age 19. His brother will be killed in ten days. Private Thomas William Hamlyn (Suffolk Regiment) is killed at age 18 becoming the last and youngest of three brothers who are killed in the Great War. Private Noel Griffith Williams (Liverpool Regiment) is killed at age 19. His brother was killed in January 1917 and they are sons of the Reverend Griffith Williams Rector of Corwen. Private George Tallent (South Lancashire Regiment) is killed at age 24. His brother will be killed tomorrow. Gunner Joseph Charles Trull (Royal Garrison Artillery) is killed at age 34. His son will lose his life in the Royal Air Force Volunteer Reserve in December 1944.